With the Premier League season slowly winding down, it is that time of the year where the player of the year is determined. More specifically the young player of the year. To be eligible for the award, a player must be 23 years or younger at the beginning of the season. Currently held by Harry Kane coming off his breakout year, could we see another Tottenham player win the award or could we see the same retain it? 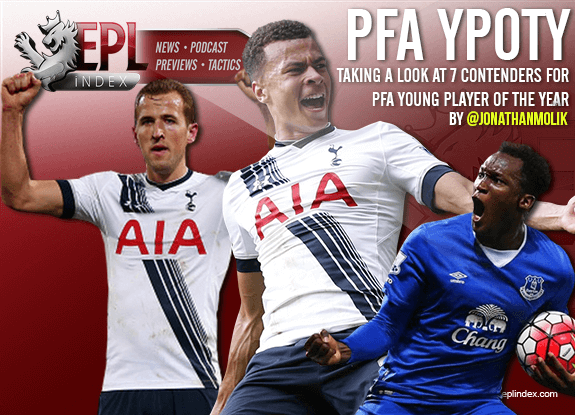 Here are my top five contenders for PFA Young Player of the Year. Coming off a move from MK Dons, Alli has not only taken the Tottenham midfielder by storm but the entire league. At only 19, Alli has featured in 29 games for Tottenham scoring seven times and creating 42 chances. Alli also has a 75% pass accuracy and over 4/5ths of those were forward passes. Not only is Alli an ideal box to box midfielder and doesn’t really lack in any specific area, he can also play out on the left which he’s done multiple times this season. Undoubtedly Alli is my front runner for the award this season. Now turning our head to Alli’s teammate and current holder of the award Harry Kane. Not only is he the first name on the Tottenham sheet, he’ll undoubtedly be the first name on the England team sheet. This season in 31 appearances, Kane has 21 goals giving him 45 in 76 for his Tottenham career. The only reason I don’t see Harry Kane retaining it is on a grand scale, Dele Alli has had an equally if not better a contribution to Tottenham’s title run. The big Belgian has been a goal scoring phenomenon since his arrival at Everton and this season has been no different with 16 goals in 28 appearances. Combining his sheer power and speed he’s virtually impossible for defenders to stop. If he isn’t in the box scoring goals, he’s out front holding the ball up, laying off to Ross Barkley who’s creating a scoring opportunity. The man sitting in behind Romelu Lukaku is none other than England international Ross Barkley. Not only is Barkley the ideal play-maker with his creativity, dribbling, speed, passing, and vision, Barkley is becoming quite the goal scorer bagging six in 28 appearances. Barkley has an 87% passing accuracy and has created 45 opportunities. Reigning golden boy winner and United’s new boy toy Anthony Martial may be beginning to live up to his price tag as the most expensive teenager ever. In his 24 appearances, Martial has scored 7 goals but that doesn’t do him justice. Spending most of the season on the left wing and easily United’s most creative player all season. His only downfall that must be brought up is his lack of strength and physical presence. I don’t see Martial winning the award but he has to at least be talked about. Defenders hardly get a look in or mention for this award year in and year out, mainly due to the hard time you have comparing their contributions to that of attacking players. Bellerin has contributed no goals in his 28 league appearances but has offered so much going forward with his overlapping runs and blistering pace. He’s also been a brick at the back and is arguably the best right-back in the league at containing forwards due to his pace, even on his heels. The French midfielder behind Leicester’s success this season, Kante has taken the league by storm and may easily be the signing of the season. In 30 appearances, Kante has completed 938 passes and 76% of them have been forward passes. He also has the highest passing accuracy on the team with 82%. So those are my top seven contenders for the PFA Young Player of the Year, who is your favourite to win? Categories: Arsenal, Arsenal (NN), EPL Index Featured Article, EPL Player Performance Analysis, Everton, Everton (NN), Leicester City, Leicester City (N), Manchester United, Manchester Utd (NN), Tottenham Hotspur, and Tottenham Hotspur (NN).' 'Tags: "Manchester United", AFC, Arsenal (NN), Arsenal Stats, Barkley, Bellerin, Dele Alli, efc, english Premier league, English Premier League Opta Stats, English Premier League Stats, EPL, epl opta stats, EPL Stats, Everton, Harry Kane, Kante, LCFC, Lukaku, Martial, Premier League Stats, Romelu Lukaku, THFC, and Tottenham. Tottenham & Arsenal – Title Races or Trophies in London?